I love the color of this cardigan. I saw so many people try it on in the blush pink - but rust color will be perfect for fall. Also, these flare jeans are a great price for under $50 - and fit really well. Tee: Runs large. I am wearing an XXS - I typically wear an XS in tees. Jeans: TTS. I am wearing a 26x32 - I typically wear 25 in COH or 7FAM jeans. 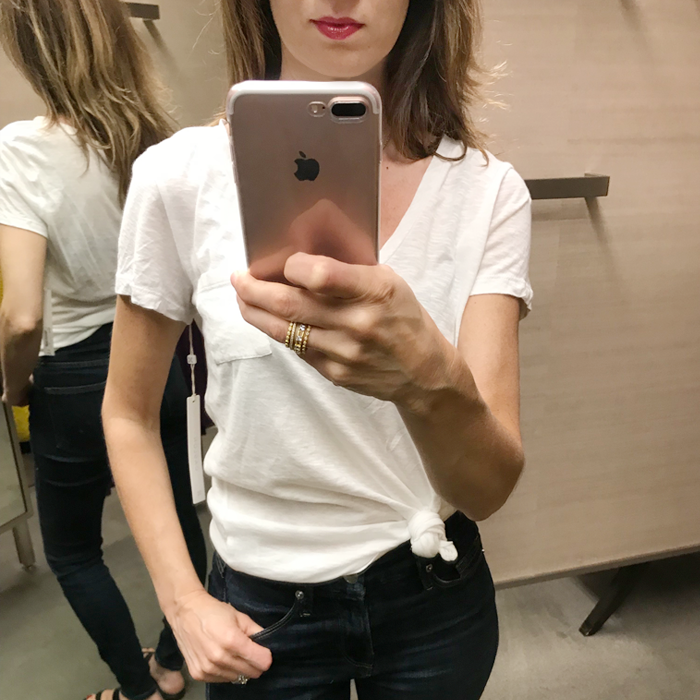 These are my favorite skinny jeans - and they are part of the sale! Jeans: Run large. I am wearing a 24 and I typically wear 25 in COH or 7FAM jeans. 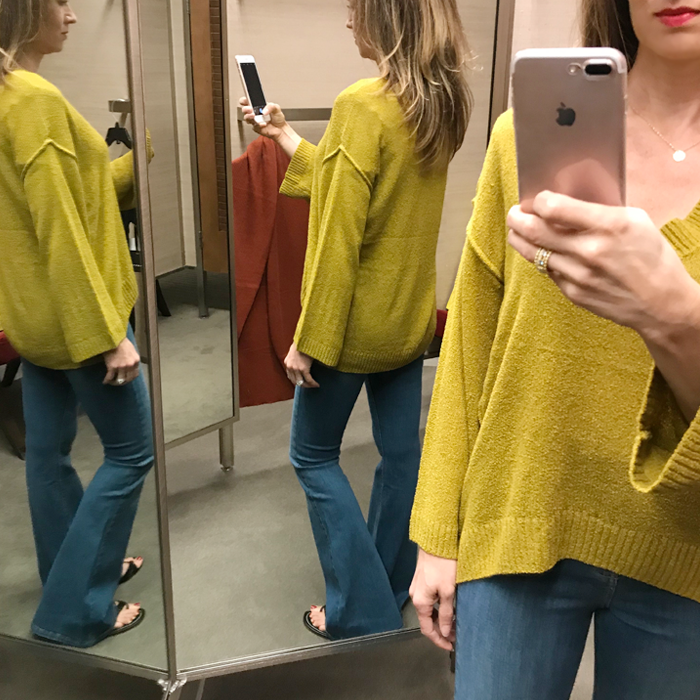 This sweater is a great deal - and comes in a several colors. 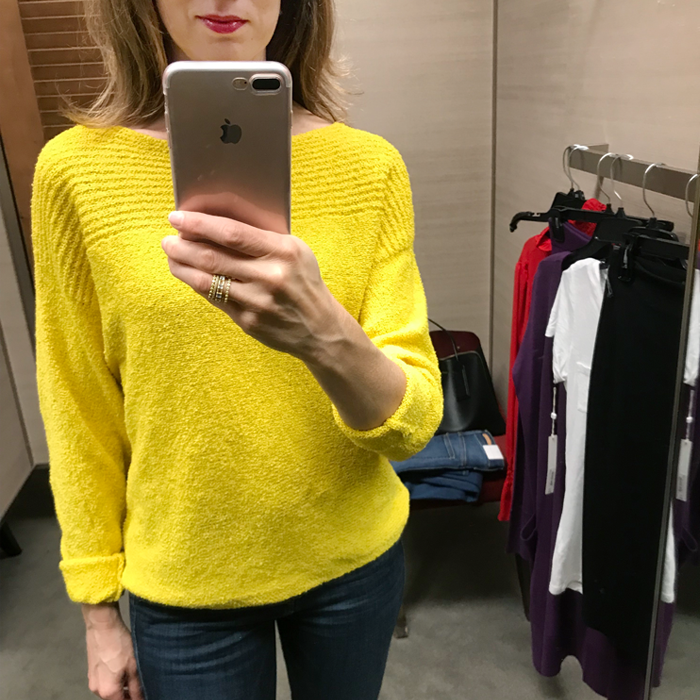 I loved this bright yellow color - but it comes in neutrals. Sweater: TTS. I am wearing an XS, and I typically wear an XS or Small in sweaters. This sweater is also a great deal - and comes in different colors. Sweater: Runs a little large. I am wearing an XS. I shared this blouse in blush color the other day. I love the bold red. Blouse: TTS. Wearing an XS. Jeans: TTS. Wearing a size 25 - and I typically wear 25 in COH or 7FAM jeans. 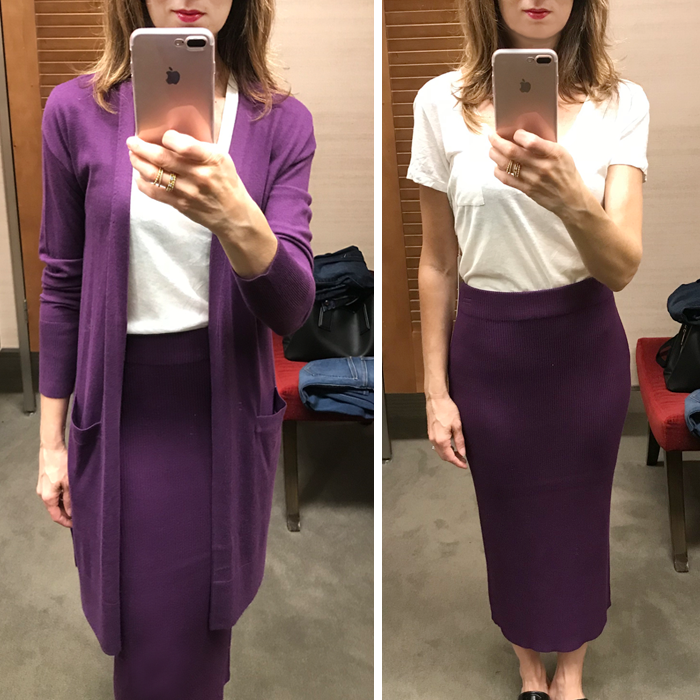 This skirt and cardigan are the prettiest purple color. 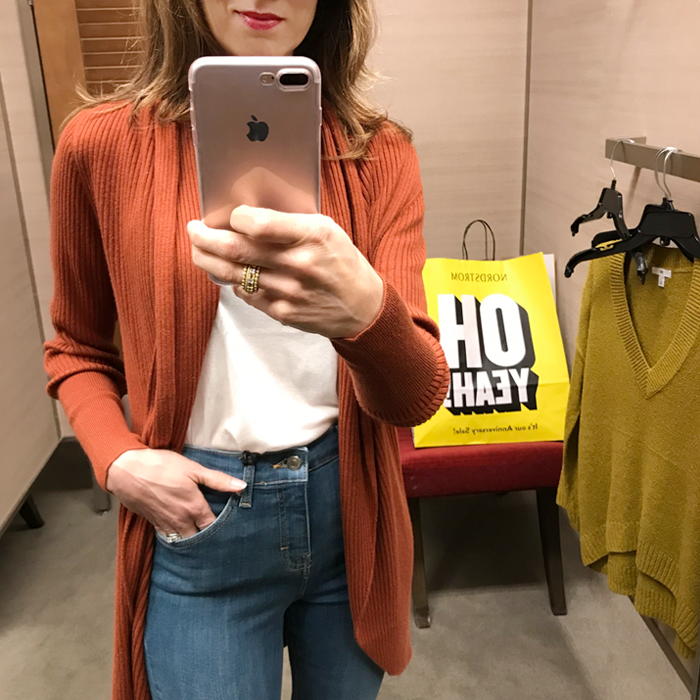 And, this cardigan is one of my favorites - and it comes in other color options. I am not sure I would wear these both together - but I tried it on that way since they were paired together. The skirt for my personal preference was a little too long (I'm 5'5") - but it could look cool with tall boots- maybe? I'm on the fence about it - but it was comfy and a really pretty color. Cardigan: TTS. Wearing an XS. Skirt: TTS. Wearing an XS. I was so surprised by how much I liked these jeans. 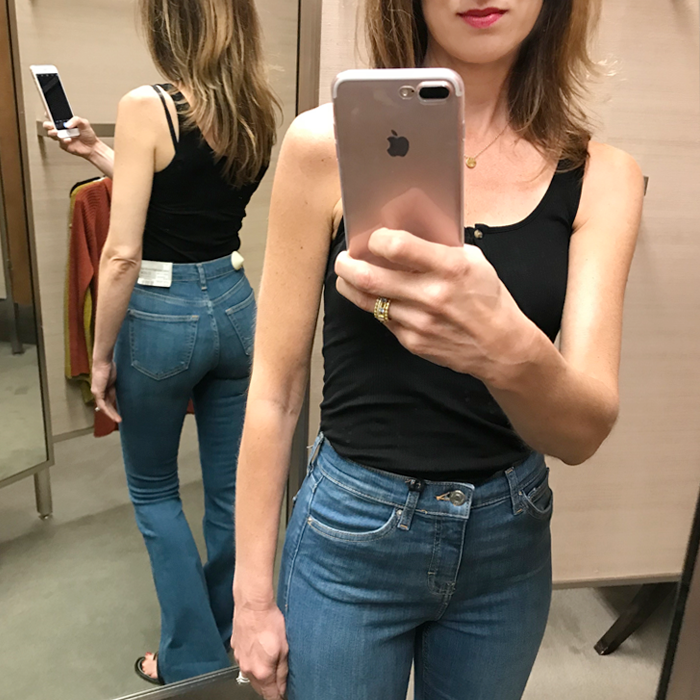 I have been looking for crop flares - and these for under $50 - fit really well, and didn't look so much like "mom" jeans which is a problem I have had with crop flares. Sandals: Run small. Sized up a 1/2 size. 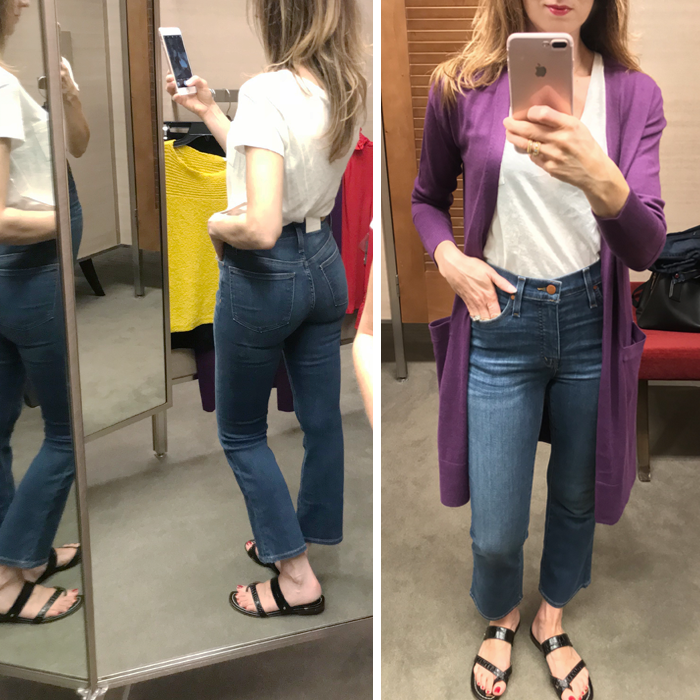 These flare jeans are a great deal (under $50) - and I love the fit of them! And, a tank and jeans - is just my style! 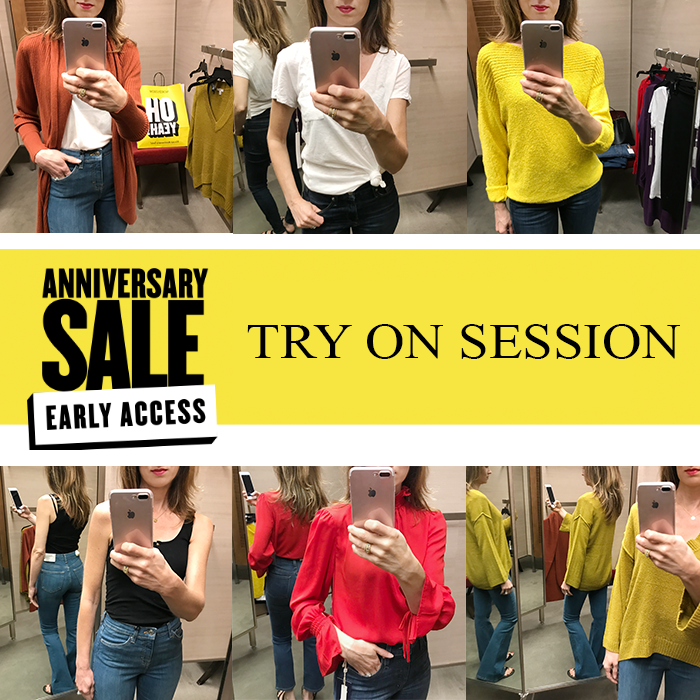 It's funny - when I went I gathered up all the clothes I liked - I realized I had all the bright and bold colors - yellow, purple, red... totally not like a lot of what other bloggers were trying on. I guess we gravitate towards what we like - and I hope you like seeing what I picked out and tried on. I am waiting for most of my #NSALE packages to arrive from what I purchased online last week. There has been some delay - and I am still waiting - but hopefully they arrive soon, and I can show you my hits & misses from the sale. This summer white blouse is 50% off. This chambray romper is an extra 40% off - making it a great deal! This classic pink blazer is an extra 40% off. This fun reversible tee is 40% off. 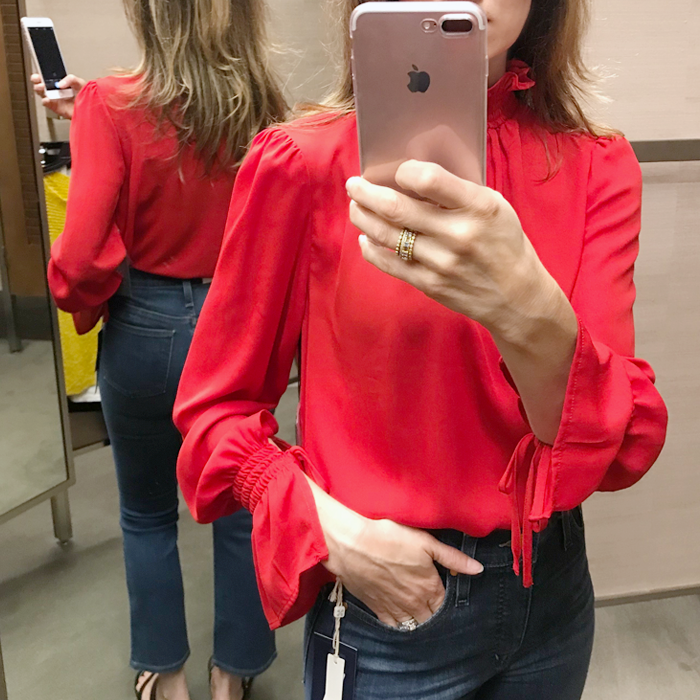 This ruffle wrap blouse is 40% off. This cute strappy cami is on sale for only $21. These new arrival sandals come in a really fun tortoise print. These fun sandals are a great deal. I love these leopard sandals. This comfy v-neck sweater is on sale for $10. This blazer is on sale for only $20. This staple tee is on sale for $5. I love those flare jeans on you! Me too...I was just going to say before I saw Kellyann's comment, I LOVE those flare jeans! I also love your color choices. I too am patiently waiting in my delivery guy for my packages! And restraining myself from buying more, lol! Seeing you makes me miss you! Can't wait to hang with you again soon. I crave COLOR in the fall (no neutrals for me!) so I love that you found so many colorful pieces! great sale overview! fun picks! It really is so helpful to see these things on. Love what you tried! You found some great stuff--I love those cardigans especially. That purple color is SO pretty! I think you found some amazing items. I personally love the flare jeans and that bright sweater! So cute and you would be fall ready in it! Thank you for sharing all of your favorites! SO CUTE!! That red Vince Camuto top is GORGEOUS! I’d love for you to join our link up tomorrow!